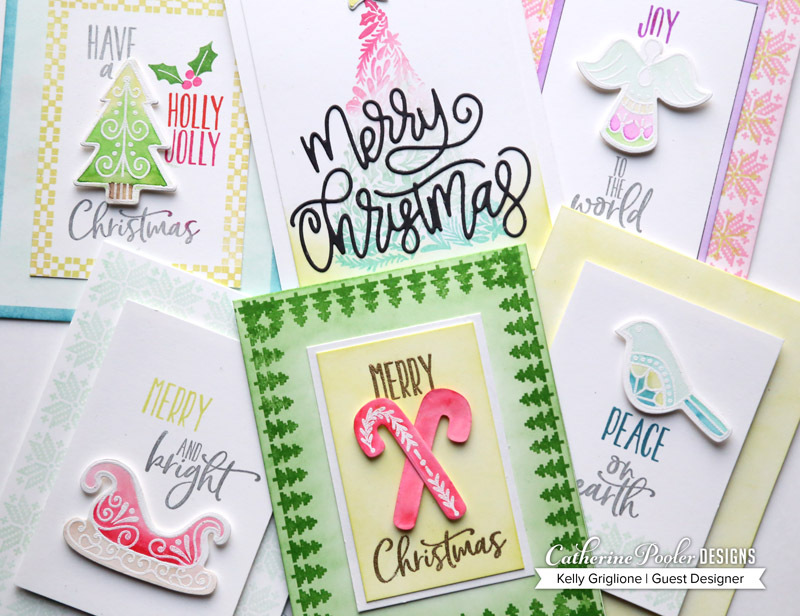 Catherine Pooler's Home for the Holidays SOA is Released! Hi folks! 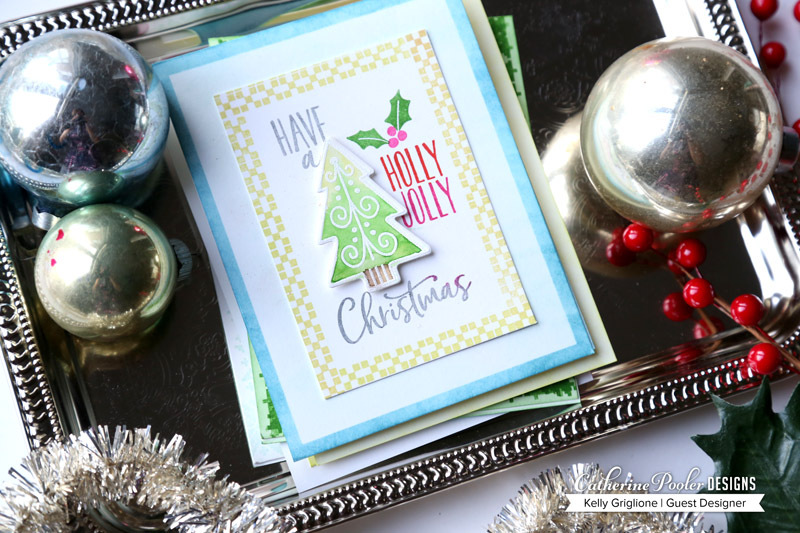 If you were at all wowed by the Catherine Pooler team projects these past few days, you're probably super excited now, because the Home for the Holidays Stamp of Approval collection is finally on sale! 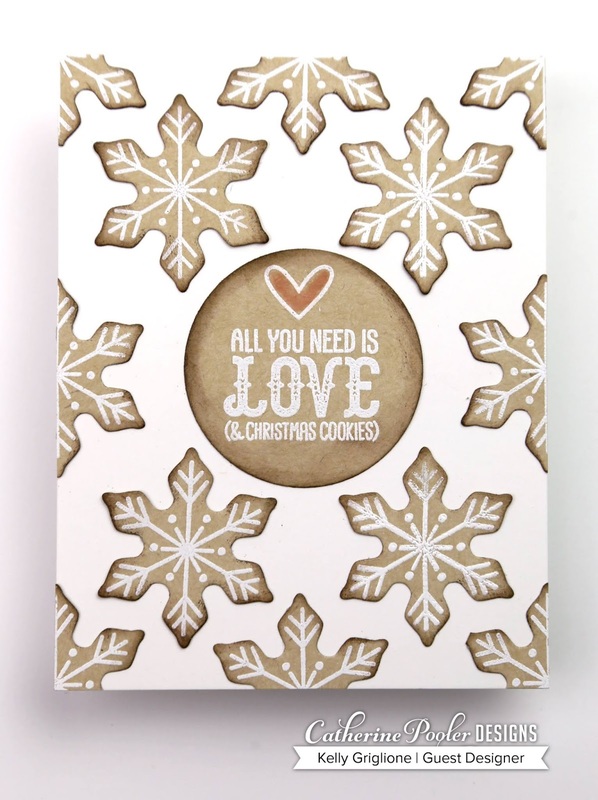 Based on all the wonderful comments I've read on the IG hop, it seems the majority of people are most excited about the Christmas cookies in this collection (coordinating dies are sold as an add-on), so I thought I'd post my Christmas cookie card and share a few tips on how I made it. 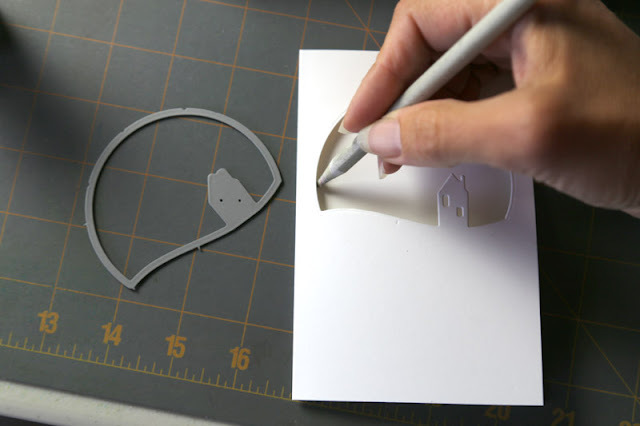 Although a few years ago I bought wire cutters specifically for cutting dies apart, I don't use them very much anymore because I like to keep as many dies together as possible so I can cut out all the images at once. 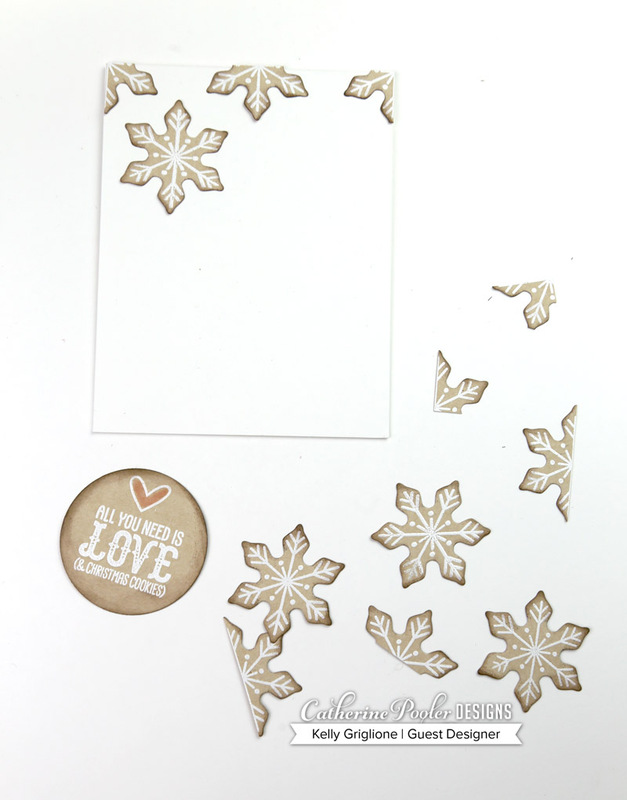 Not that I'm a lazy stamper, hahaha, but I do want to maximize my time available for playing around with pretty things, vs. administrative tasks like die cutting images. 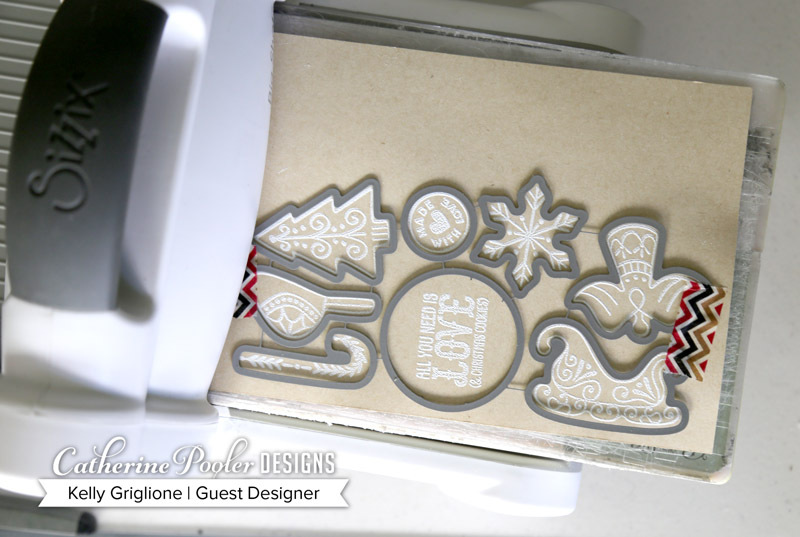 Here's how ... set your dies with the cut side down on your misti. Then individually line up each of your stamps on top of the dies (stamping side down). Once you are set, close the lid of your misti. Now whatever you stamp will line up perfectly with every single die! Tape the connected dies on top of your stamped/embossed images and run them through. Can I tell you how GRATIFYING it is to have them all cut and ready at the same time?!? I feel so efficient! 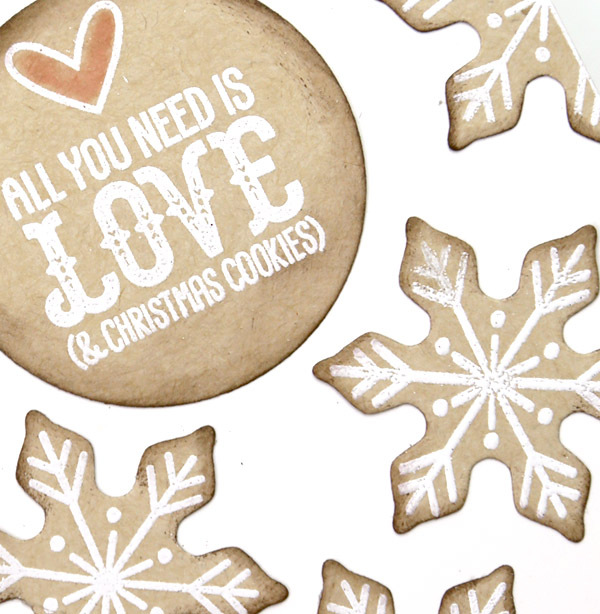 To make this particular card, I "baked" 7 batches of cookies, and took out all the snowflakes. Four of them I kept intact, two I cut in half, and one I cut in quarters. Then you just adhere them on the card as you would arrange them on a baking sheet. I also inked the edges a little so they're baked. The best part is now I have 7 sets of all the other cookies to play around with! The one set I didn't see as much is the Tiny Wishes stamps and Tiny Tags dies. 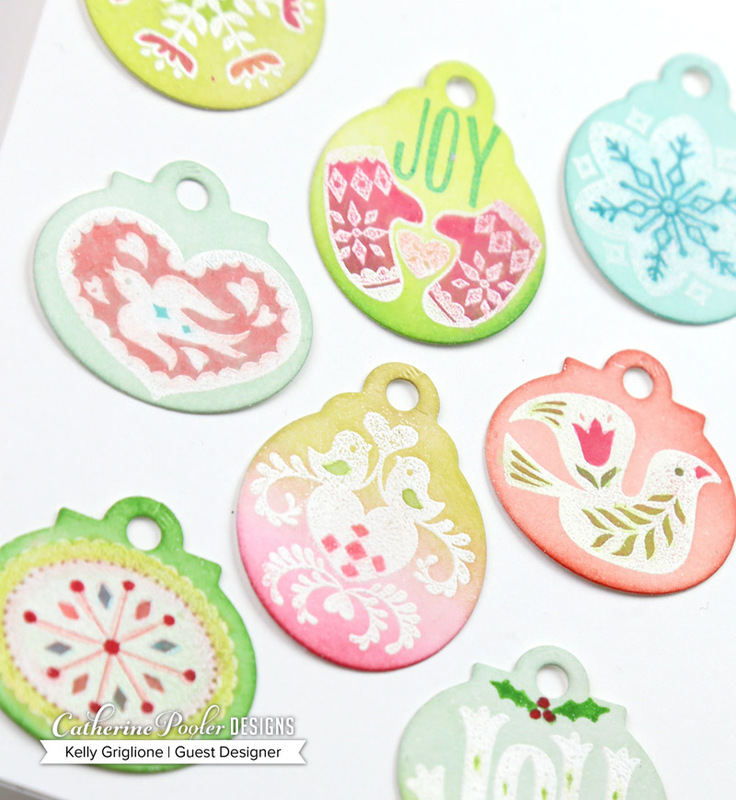 I stamped and embossed most of the images on their coordinating tag shape just because I was dying to see what they all looked like! I really can't wait to use these on cute little gifts this season. By inking the background, and adding details with marker or pencils, you can really have fun personalizing each of these designs to what you need. Plus there's a really good mix of sentiments, bold images, and outlined images. Well, I sure hope you've enjoyed seeing everyone's Home for the Holidays projects these last few days. I've certainly had a blast, and am so thrilled Catherine asked me to join along for this release! If you're at all interested, I'd make up my mind sooner vs. later in case they sell out. Hate it when that happens! Hello Folks! 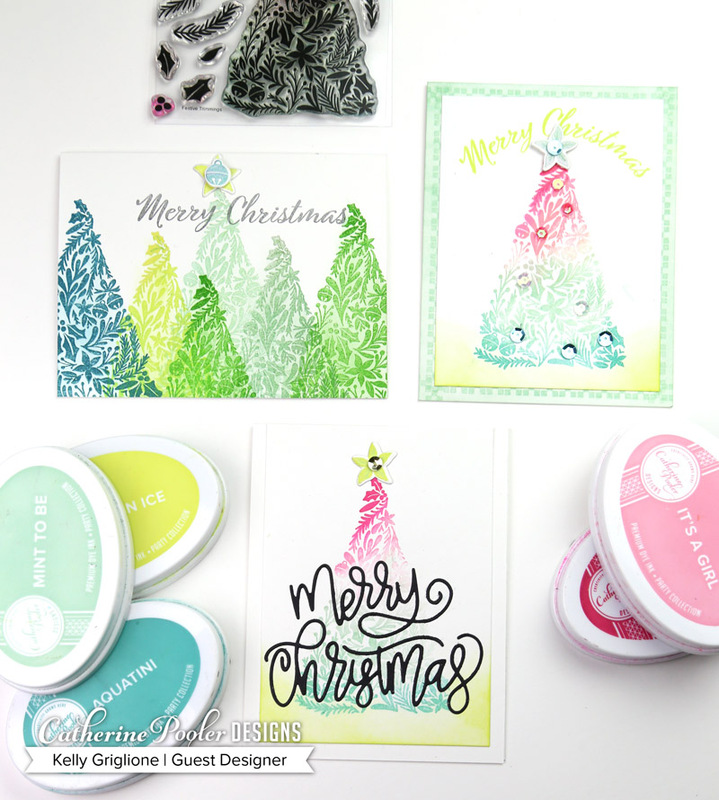 I'm thrilled to be asked to participate in the Catherine Pooler Home for the Holidays Stamp of Approval release!! You should have arrived from the fabulous Allison Cope, but if not feel free to start at the beginning with none other than Catherine Pooler. If you're not familiar, the Stamp of Approval box is a collection of products which are all exclusive to Catherine Pooler designs, so you won't be able to purchase them anywhere else. They also are only available as a whole collection and won't be offered individually for several months. All the products in the collection were designed to compliment each other. 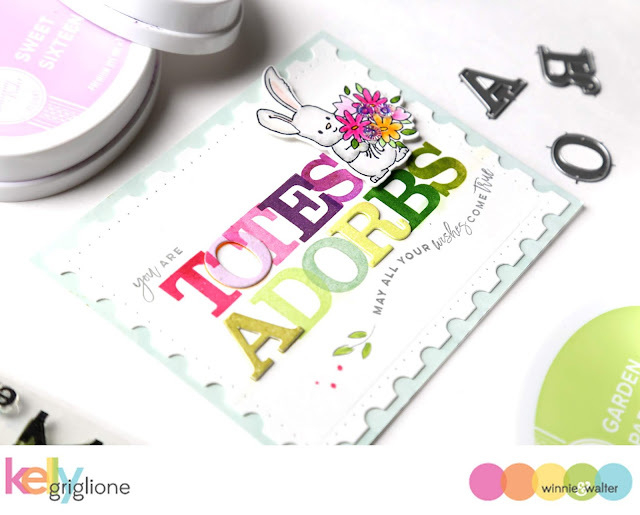 If you need to start playing with these goodies, I would recommend that you subscribe to the wait list at Catherine Pooler Stamp of Approval so you're the first to know when it's available. You don't have to pay anything to subscribe, you're just billed if and when you decide to buy the collection. Historically, the collections have sold out rather quickly. 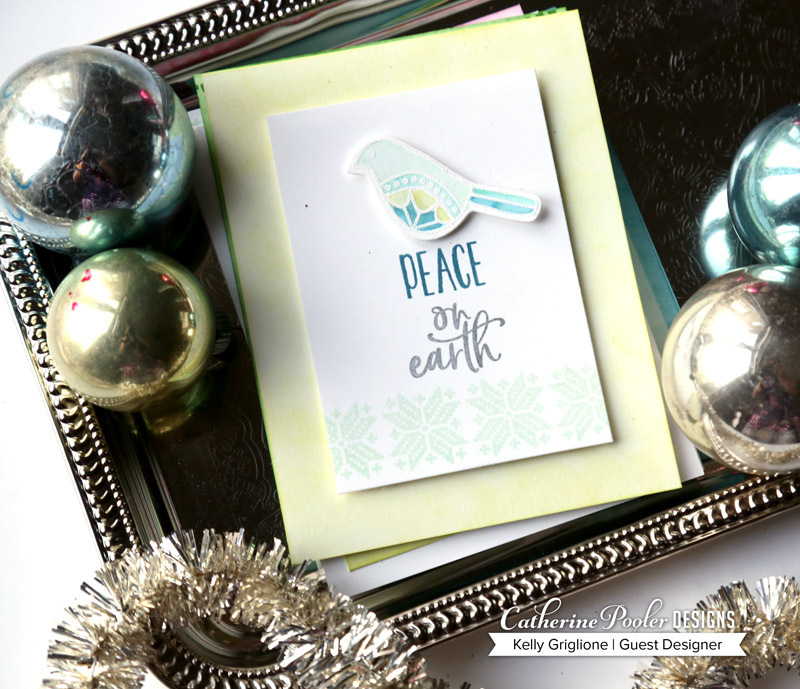 Home for the Holidays ... doesn't the name of this collection alone just make you want to hibernate in your craft space for the weekend with festive music while you stamp out a few early holiday cards? Well, that's kinda what I did : ) I ended up making a set of cards following the same basic formula: Sentiment from the Holiday Mix Stamp Set plus a watercolored focal point from the Christmas Cookies Stamp Set make up the panel. Then add a border from the Cozy Borders Stamp set. Here's a super simple card, with that exact formula. 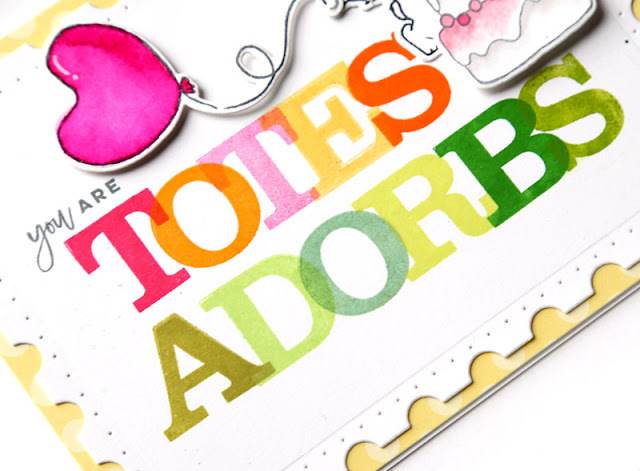 There are so many different sentiments to mix and match, with such cute fonts! I love that they are separate stamps so you can easily change the colors. Let's talk about how cute that sleigh is, right?! It's embossed in white and then watercolored with Party Dress ink. I'm big into details, and totally fell in love with how the tail of the "g" fits in the seat of the sleigh. 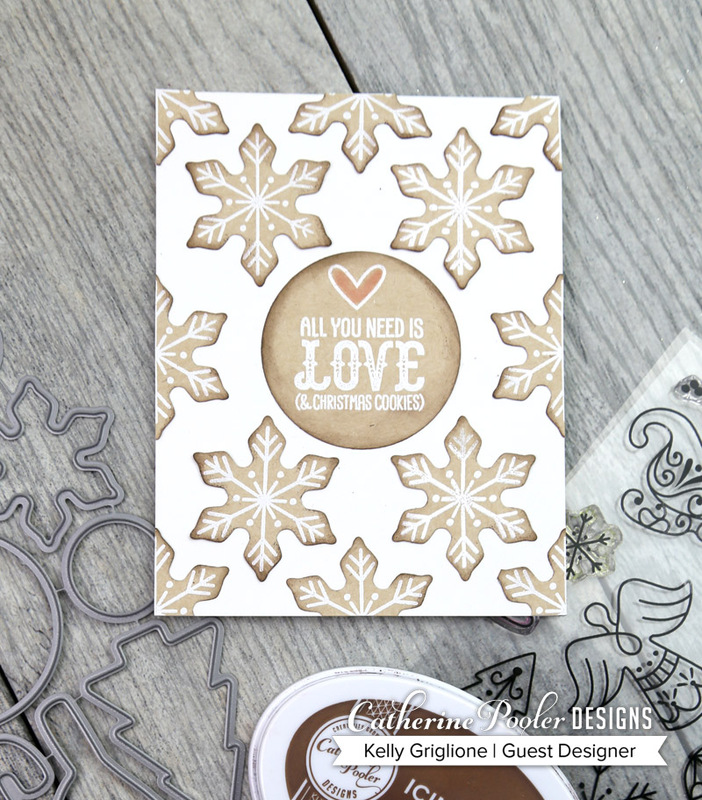 A subtle background from Cozy Borders is stamped on the card base. 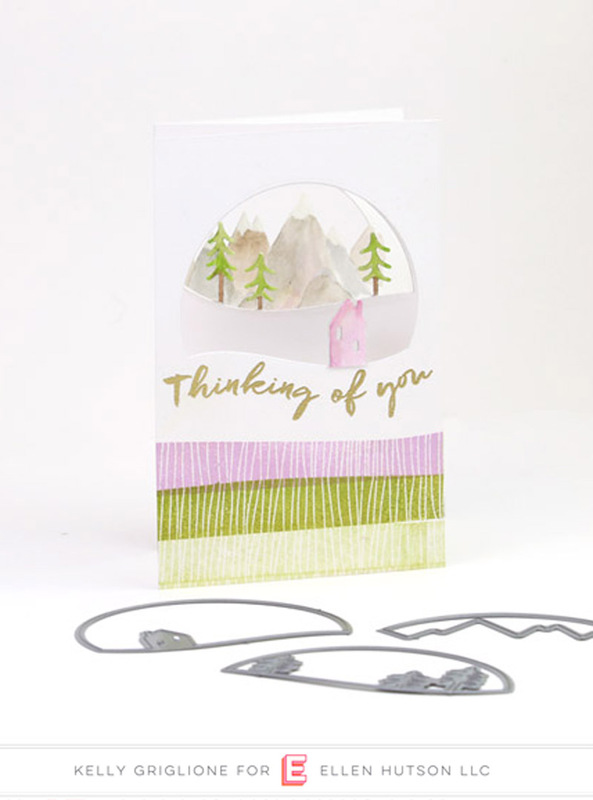 How cute are those cozy trees stamped as a border around the card? And so simple too. 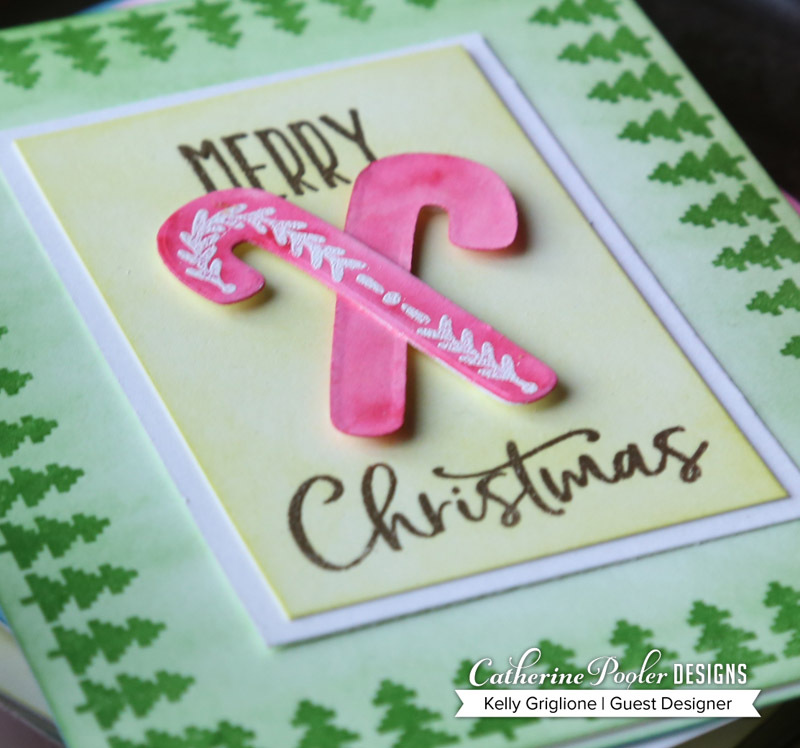 The candy cane is the focal point here, but I did want to criss-cross them so I die cut a second cane and just flipped it over. 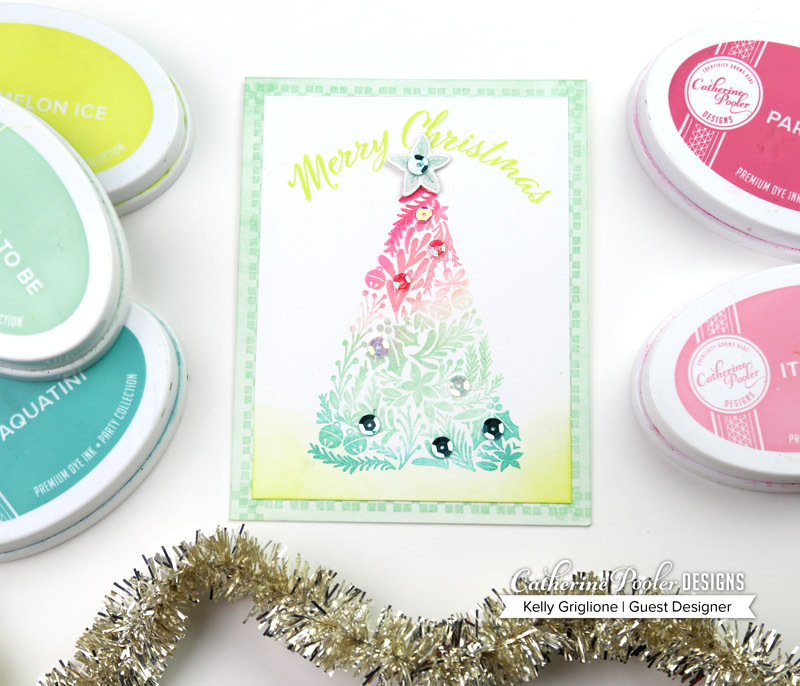 This card features the angel cookie watercolored in several soft colors. I masked off the outer 1/8" of the panel and sponged ink on the ends. The border is stamped in purple Sweet Sixteen, but do you see hints of lime? I stamped a small snowflake in the center of each purple design. You can't tell there's a snowflake there, but I do like the hints of lime color you get peeking through all the purple. I love that the Christmas Cookie images are broken up so you have specific areas to color. This totally takes the guess work out of how to color them! Just fill each section with a different color, like on this bird. No need to do any shading if you don't want to. This one is probably my favorite. It's got a couple different sentiments, in a couple different colors, with some holly leaves and berries from a fourth set, Festive Trimmings. I love that there are stamps from FOUR different sets on this card, yet they all work seamlessly together. It was fun picking different colors to watercolor the cookies with. I think the cards all look different enough, yet by having the same formula they come together fairly quickly. There will be 3 random winners chosen to receive a $25 gift certificate to the shop! To enter, please leave a comment on this post. The winners will be announced on on Catherine Pooler's blog on September 24th. Your next, and final, stop is the very lovely Lydia Evans who always has the most beautiful creations! Kelly Griglione <-- you are here! Hi Folks! 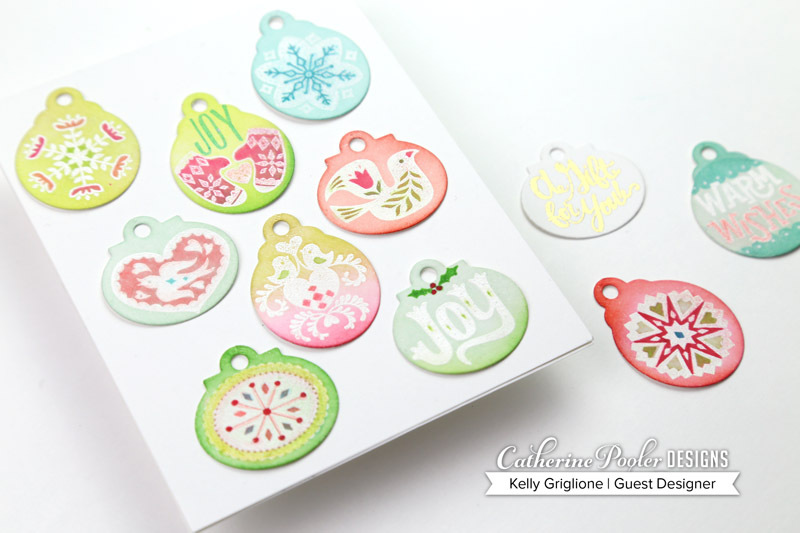 I'm super excited to participate in the Catherine Pooler Home for the Holidays Stamp of Approval release! Today we're having a hop on Instagram, but I thought I'd also do a blog post to show a few more details of the cards featured. 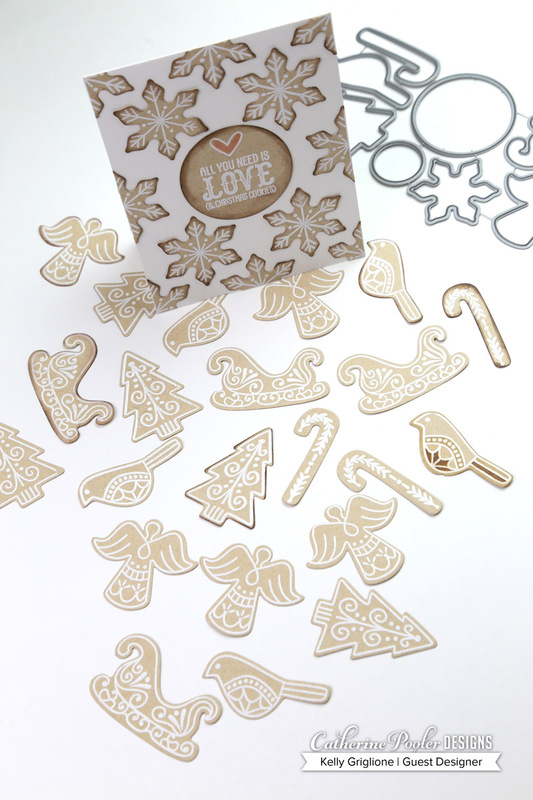 The collection comes with several stamp sets, including Festive Trimmings which features a giant tree that is pre-decorated for you : ) If only my tree in real life came pre-done with poinsettias, jingle bells and holly. 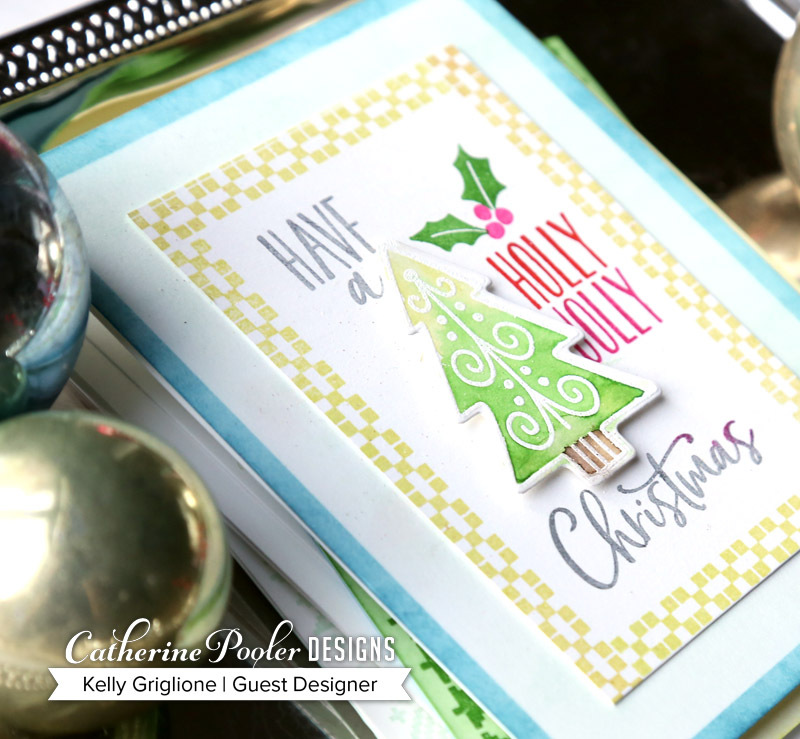 The border on the card itself is from the Cozy Borders stamp set and can be used to add some tone-on-tone interest to all of your holiday cards. 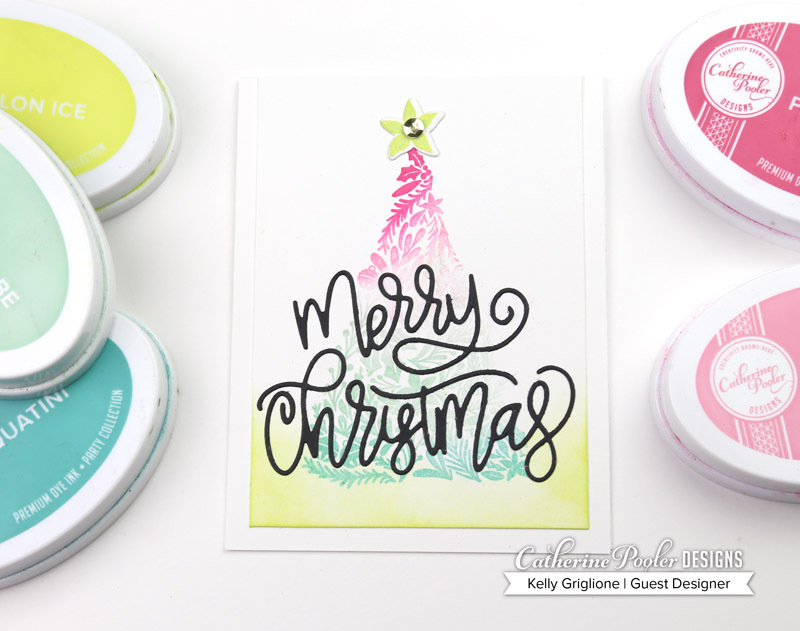 After putting the tree stamp on my Misti, I inked it in a few different CP inks to get the gradient effect. In my mind that kind of takes the place of coloring each element differently, like the bells, poinsettias, etc. The sequins stand in for ornaments, and also make the tree a little more festive. This card is very similar, in that I stuck with the same main tree image on the card in gradient shades of the same ink. Instead of curving the sentiment around the top of the tree, I used the amazing new Merry Christmas Layered Word dies for the scripted sentiment. What an attention-getter! And that font!!! Wanting the focus to be on this gorgeous sentiment, I kept the rest of the card clean and modern, only mounting it as a panel onto the card. The top of the tree is crowned with a poinsettia cut with the Festive Trimming dies (sold outside of the collection). The final card I made with this festive tree features a forest. I love when one stamp can be repeated several times to make a bigger impact on your card. To lower the contrast between the white of the paper and the ink on each tree, I used a sponge to blend a bit of that color in the middle of each tree. Are you all as excited as I was to see the rest of the collection?! Stay tuned, the entire design team, along with some special guests, will have a lot more to share with you in a blog hop tomorrow. Then in two days we have a video hop, and in three more days (Wednesday, September 19th) the Home for the Holidays collection will be released! So much going on! 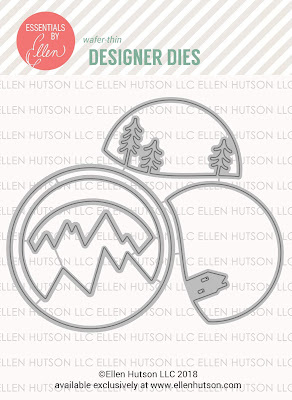 New Alpine Windows Dies from Ellen Hutson! Hi Folks! Have you seen the new Essentials by Ellen release from this weekend?! It's simply to DIE for (pun very much intended). 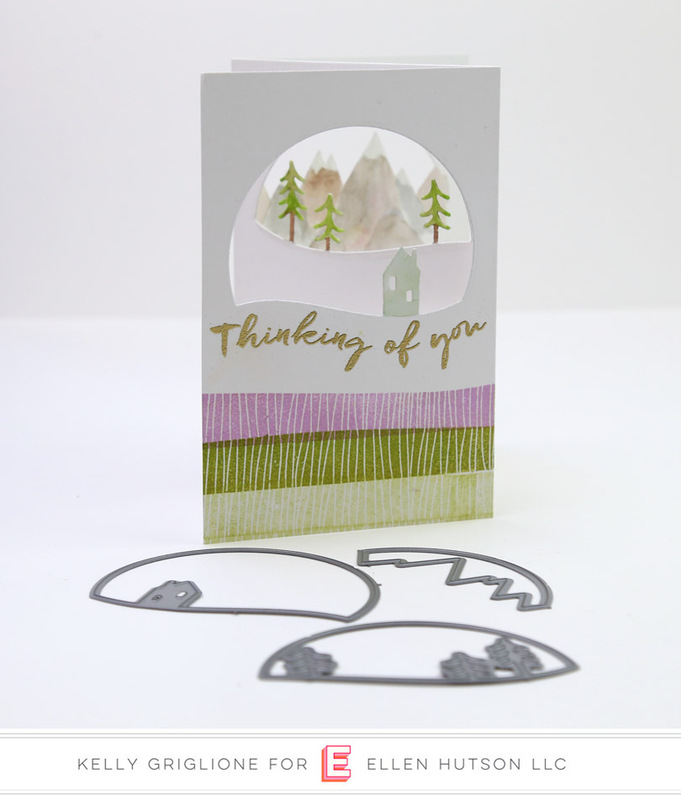 The Alpine Windows Die by Julie Ebersole is nothing short of amazing ... this combination of dies, when used together, will create a tunnel card effect. Let's take a look! These dies are intentionally sized to fit a tri-fold card that's made from a standard 8 1/2 x 11 sheet of paper. I cut the height of the card to 5 1/2 inches, but you can make it as tall as 8 1/2 inches if you'd like. 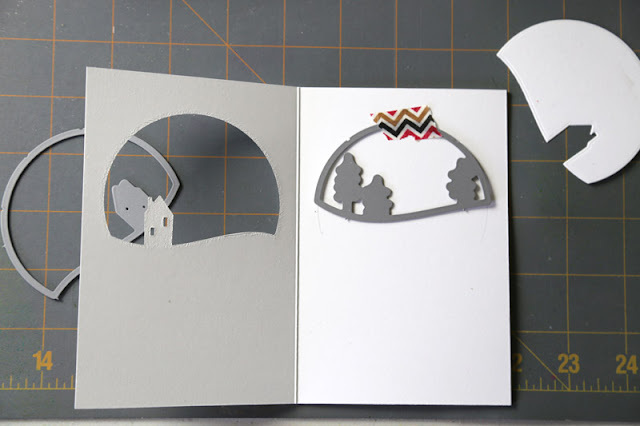 If you're making the same card as mine, cut your cardstock to 5 1/2 x 11, and then score at 3 2/3 inches and again at 7 1/3. When you fold the cardstock into thirds you'll have a 3 2/3 x 5 1/2 inch card. The die with the house on it should be cut on the first panel. 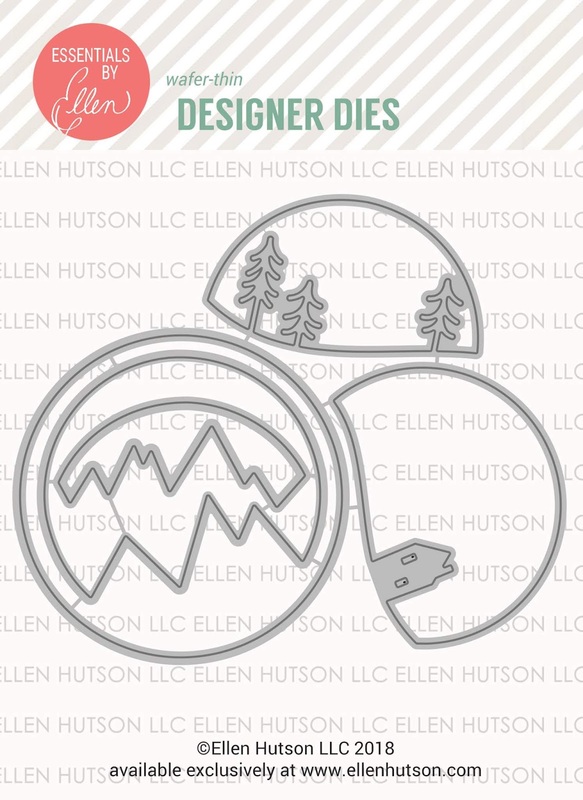 Once that's done, trace along the inside of the circle so you know exactly where to put your next die. Line up the tree die on top of your pencil marks, cut that out, and repeat with the mountain die (trace around the circle to the third panel, attach the mountain die on the pencil marks, and cut that out). When you're done you'll have windows on all three panels. On this card I've done simple watercoloring for the house, trees and mountains, but you can use any coloring medium, or even just leave it all white for an elegant look. When the card is collapsed, you see a dimensional scene. Also in this photo you see a glimpse of the new stamp set I used to make the three bands of color on the bottom of the card. 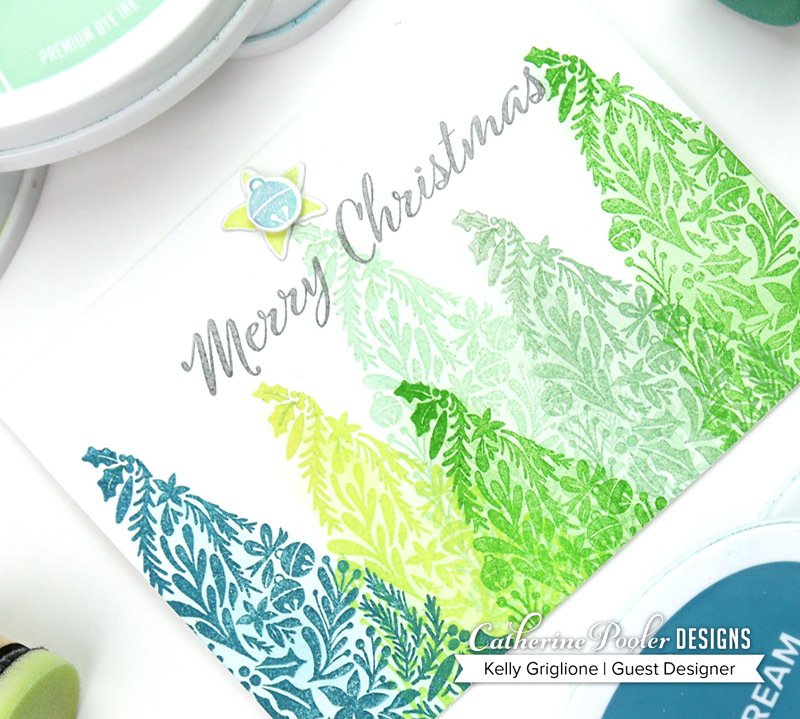 It's from Winterscapes by Julie Ebersole and is the perfect way to quickly add some color to your projects. Here's what this precious little scene looks like straight on. I really like the dimension you get without much bulk when the card is folded up. 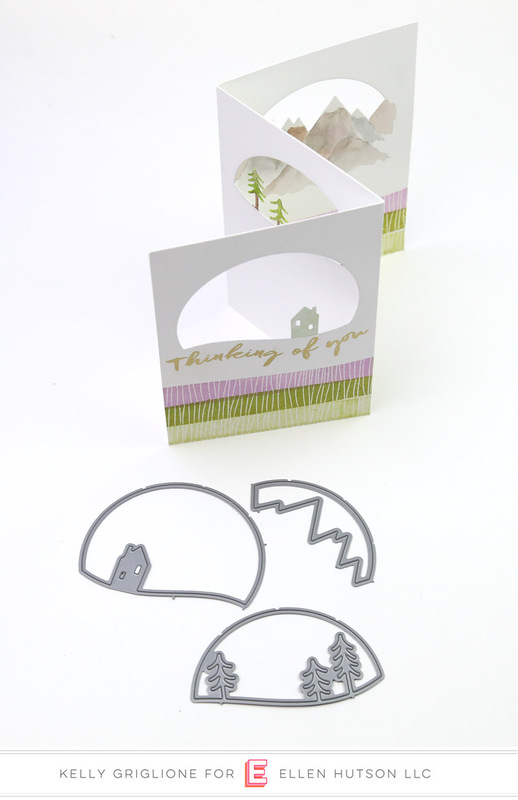 Here's a slightly different version of this card, with a purple house to stand out from the background a little more. One more thing to note, as perfect as this set of dies would be to make Christmas Cards, you can see how this particular card isn't Christmas-themed at all. In fact, I have a few different ways to use these dies coming up later in the week, so please stay tuned. What I love about this set, or any alpha set, is that it lets you make your own custom greetings. On our family vacation to Washington DC this summer I saw someone wearing a tshirt that said "totes adorbs" and thought that was so cute. I pulled out my phone and sent myself an email with "totes adorbs" in the subject line so when I got home I'd remember to use that on a card sometime. 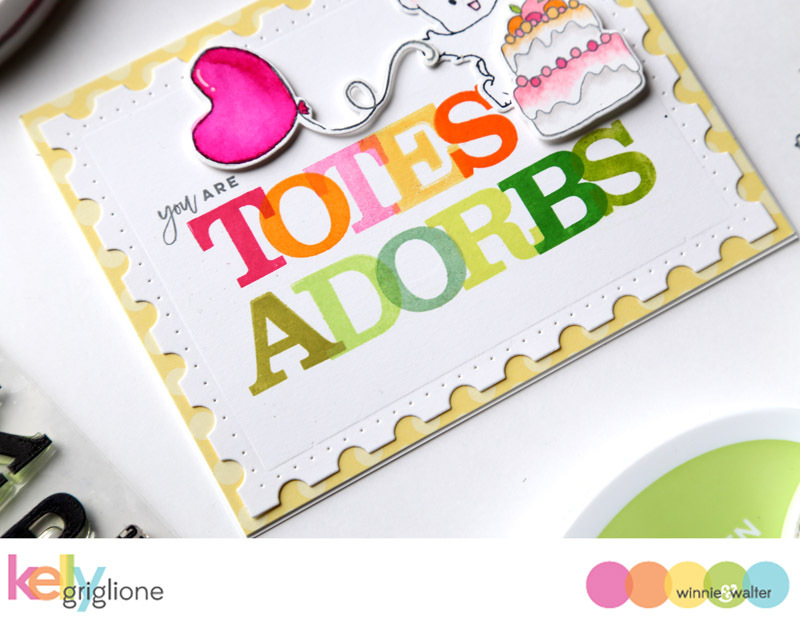 The scale on these particular letters is great for using most of the card and having the text be your focal point. I like to overlap the letters so it's not as noticeable if the spacing is off, and I like the different colors that are created when the ink is layered. The totally adorable bear and cake are from Happy Dance with Evelin T Designs. The balloon is from So Tweet with Evelin T Designs, and the tiny flag is a useful stamp from Wish Big with Evelin T Designs. Here's another version of that card. This one features the bunny from Happy Dance with Evelin T Designs. Before putting the sentiment (from Sentimental: Birthday) on my acrylic block, I curved it to fill up more of the space on the panel. And let's talk about the cute postage stamp panel ... that one's from Essentials: Lana Cutaways. This is the larger size, there's a smaller version available too which would be good for a smaller sentiment. I'm looking forward to giving these to some special little girls in my life!